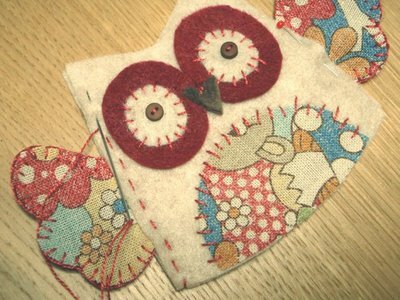 Print out the template so that the owl body is 4 inches (10.16 cm) wide at the bottom. Cut the templates out, following the lines. 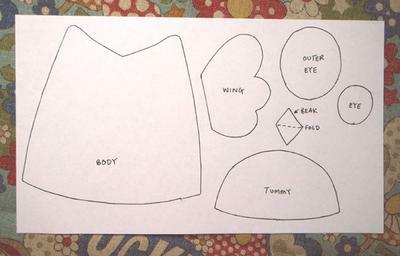 Using the templates cut 2 body pieces in the main color of felt, 2 outer eye pieces in the contrasting color of felt, 2 eye shapes in the main color of felt, 1 beak shape in the color of felt chosen for it, and 1 tummy shape in the patterned fabric. 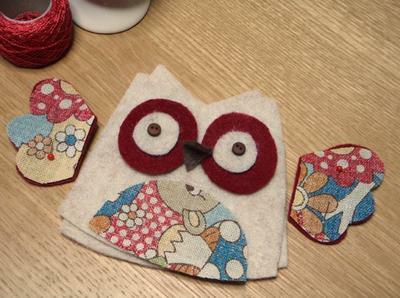 For the wings, cut 1 in the contrasting color of felt and 1 in the patterned fabric, then flip the template and repeat. 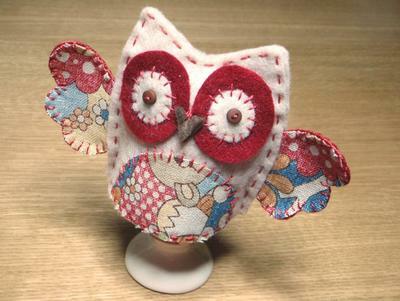 Position the tummy fabric on the bottom edge of the front of the owl and applique on with the embroidery floss using random straight stitches. 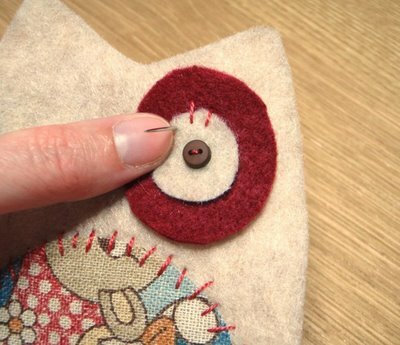 Place one button in the center of the smaller felt eye shape with the outer eye shape underneath. 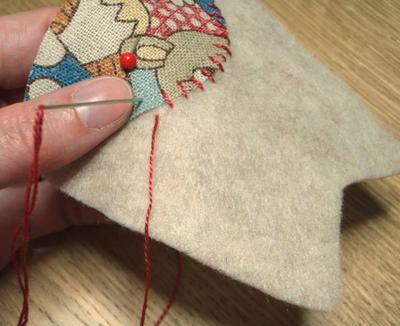 Sew on the button and then fix the eye, again with the embroidery floss and using random straight stitches. 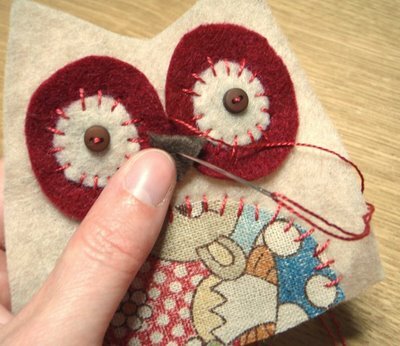 Attach the beak between the eyes by folding it in half, then sewing 2 or 3 tacking stitches with the embroidery floss. PARAGRAPH 5Pin each of the wings together, patterned fabric facing front and felt to the back, and sew around the edge with the embroidery floss using blanket stitch. 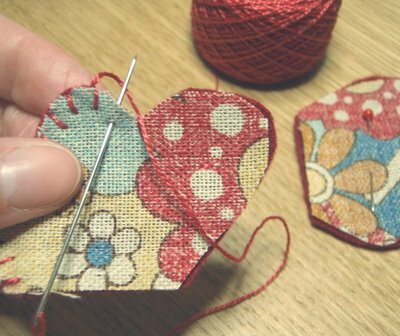 Once both wings are complete, sandwich them at either side of the body between the front and back of the cozy and join everything together with the embroidery floss using a running stitch through both layers all the way around. 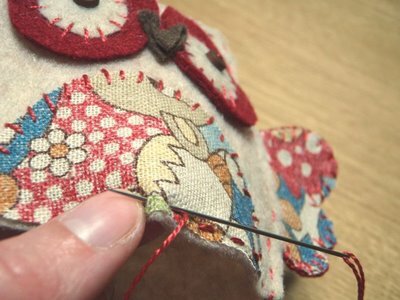 When you get to the bottom edge, stitch the running stitch so that it only goes through the top layer which will help to anchor the fabric appliqued tummy. And there you go, one owl egg cozy! © Amy's tutorial was taken with permission from lucykatecrafts.blogspot.com.